This week, as we honor the symbol of this great nation, lets look at elements of its story. It is said that New Jersey Congressman, Francis Hopkinson, created the original 13 stars and 13 stripes design. 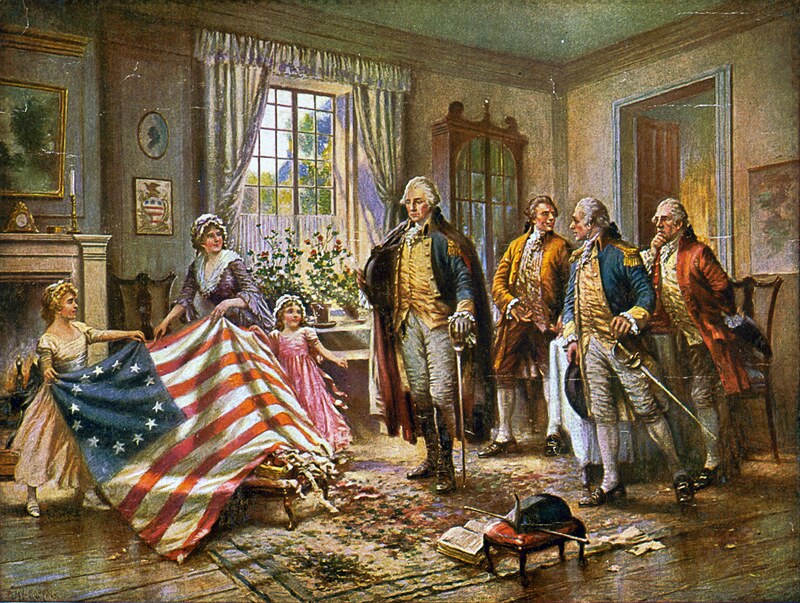 Although there is no historical evidence and many historians refute the claim, Betsy Ross, a widowed Philadelphia upholstery business owner and seamstress, is commonly credited with sewing the first flag. As the story goes, Betsy made the flag in June of 1776 after a visit from President George Washington, Robert Morris, and her husband’s uncle, George Ross (depicted below). WHY RED, WHITE AND BLUE? The new flag design was first carried into battle on September 11, 1777, in the Battle of the Brandywine. Americans first flew the U.S. Flag over a foreign territory in early 1778 at Nassau, Bahama Islands, following the capture of a British fort. Not bad – strategic win and beautiful place. Win, win. “Old Glory” is the nickname of a 10’ x 17’ U.S. flag, owned by William Driver, a sea captain from Massachusetts. The story goes it survived multiple attempts to deface it during the Civil War. It was last displayed in Tennessee at an exhibition in 2006. * The U.S. flag is typically displayed sunrise to sunset. It should be raised briskly and lowered ceremoniously. It should not be flown during rough weather. * When displayed flat, vertically, the union stars should be in the top left corner of the onlooker. * When the flag is raised or lowered during a ceremony, or as it passes by (ex. parade), everyone except those in uniform should face the flag with the right hand over the heart. * The U.S. flag should never be dipped toward any person or object. * The U.S. flag should never touch anything beneath it. * The White House, Washington, D.C.
On August 3, 1949 President Harry S. Truman officially declared June 14th as Flag Day. U.S. FLAG ON THE MOON? There were six Apollo missions that included an astronaut planting a U.S. flag on the moon surface (Apollo 11, 12, 14, 15, 16 and 17). Back in 2012, NASA published a piece of work by James Fincannon titled, “Six Flags on the Moon: What is Their Current Condition?” Many believe the flags could not endure the volatile environment, but the article includes lunar photography that may contain flag “shadow” and proof they continue to stand tall.